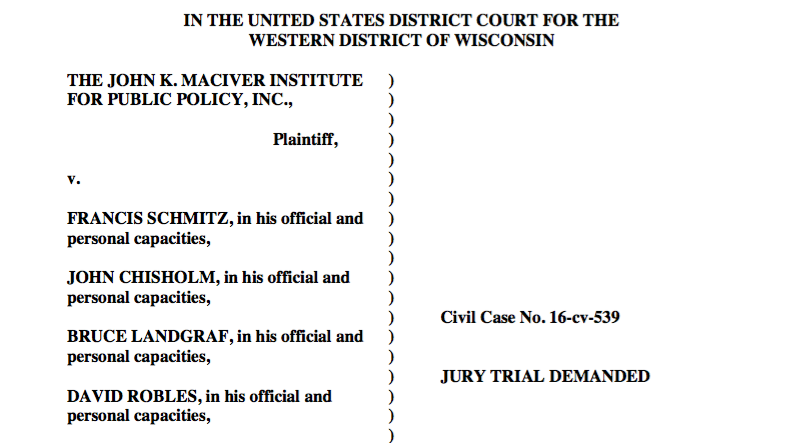 Madison, WI—August 1, 2016-The John K. MacIver Institute for Public Policy, a Wisconsin based free-market think tank, filed a class action lawsuit today against Milwaukee County District Attorney John Chisholm, other employees of his office, and senior staff of the now- defunct Government Accountability Board (GAB) for illegally seizing MacIver’s digital records during the infamous John Doe II investigation of conservative groups and individuals. The suit maintains that the ringleaders of the probe violated the Stored Communications Act (18 U.S.C. §§ 2701–2712) by secretly requesting, obtaining, and cataloguing millions of personal and politically sensitive emails, contact lists, calendar entries, and associated records from the MacIver Institute and dozens of similarly situated individuals and groups in an attempt to amass a staggering database of political intelligence. In addition to Chisholm, other defendants in the suit include former GAB Director and General Counsel Kevin Kennedy, John Doe Special Prosecutor Francis Schmitz, and other employees of the GAB and the Milwaukee County DA’s Office. “Because of their secrecy, defendants denied us the opportunity to ask a court to review their seizures before the harm was done,” said Brett Healy, President of the MacIver Institute. “Now, years after defendants unlawfully seized and catalogued millions of our sensitive documents, we ask the court to vindicate our rights under federal law,” added Healy. “Chisholm and the other defendants seized every email, contact, calendar entry, and every document in my account at the MacIver Institute—all without notice or review by a proper court,” said Brian Fraley, Senior Fellow of the MacIver Institute. “The SCA exists to prevent exactly this kind of abuse and to protect individuals and groups from rogue agents like Chisholm and Kennedy. The law is ideologically neutral, as it should be. The fact that conservatives were the targets and victims here will bring no joy to liberals, for if agents of governments can ignore the law to target their ideological foes, no one is safe,” said Fraley. The Stored Communications Act required that Chisholm, Kennedy, and Schmitz provide prior notice to their targets or seek a warrant from a Wisconsin circuit court before seizing their electronic communications. In October 2013, Defendants requested, obtained, and executed a secret John Doe warrant to MacIver’s email provider, Google. MacIver didn’t even know about the seizure of its information until the Wisconsin Supreme Court ordered Doe Special Prosecutor Francis Schmitz to notify all the targets of the information that he seized. MacIver finally learned that the Defendants requested its records in December 2015—although, despite the order of the Wisconsin Supreme Court, Schmitz still refuses to disclose exactly what records the defendants seized. The MacIver Institute is seeking monetary damages on behalf of itself and others whose records were illegally seized. MacIver is also asking the court to order the defendants to disclose exactly what records they seized and to prohibit the defendants from disclosing the records or further violating the Stored Communications Act. Click here for more regarding their witch hunt and check this space often for updates on the MacIver class action suit.